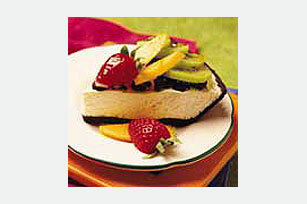 This fruit tart is extra special because not only is it full of assorted fresh fruit, but it also has an extra-creamy filling and chocolate cookie crust. Beat cream cheese and sugar in medium bowl with mixer until blended. Gently stir in COOL WHIP. Top with chopped cookies and fruit; brush fruit with preserves. Save 30 calories and 4g of fat per serving by preparing with PHILADELPHIA Neufchatel Cheese, COOL WHIP LITE Whipped Topping and Reduced Fat OREO Cookies.